From tuna to billfish and more, Daiwa's Saltist Lever Drag Two-Speed Conventional Casting Reels are designed for absolute reliability. Spool with mono or braid, there isn't much Saltist Reels can't handle. Features include a one-piece aluminum frame and sideplate, precision helical-cut stainless steel gears, six CRBB corrosion-resistant ball bearings, machined-aluminum spool, Ultimate Tournament carbon drag, Infinite Spin freespool, and offset power handle with speed knob. The Saltist compact, smooth-casting design offers the ability to toss live bait or artificial lures with ease. "I use this reel for rockfishing. Very smooth even have 2 big red snappers on, like 5 lber each. I use the low gear when fish is on, and high gear when retrieving line with no fish on. When doing rockfishing with low gear, it was as smooth as silk, but the disadvantage with the low gear is slower retriving." 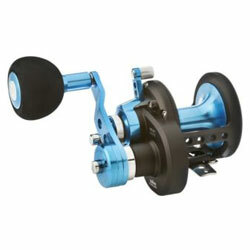 "I PICKED UP THE "30" SIZE 2-SPEED, LEVER DRAG SALTIST REEL WHEN IT HIT THE SHELVES. INCREDIBLE ! I SPOOLED IT WITH 300YDS. OF 40LB BRAID AND 65YDS OF 20LB TOP SHOT. THEN PAIRED IT UP WITH MY OKUMA, CEDROS JIGGING ROD..........GREAT COMBO."